Wallace’s freehand writing did not faze John Krasinski, who made the screen adaptation. Krasinski, an established film and television actor, was enamored of Wallace’s book. He took the four interview sections, most of which are not in usual Q&A shape—there are A sections without Qs, along with many other vagaries—and molded them into a series of relatively formal interviews. The shape of this film will astonish no viewer, which, in a peculiar way, is part of its eventual daring. The interviews are conducted by a graduate student, a young woman, who is doing research for a dissertation on current male attitudes toward women. This dissertation device justifies and unifies the film. Almost all the settings are in a university—student union, classrooms, quads, and so forth. For a good while, we don’t even see the questioner, we just see the male subjects answering her questions (though many of the responses are intercut with other material). None of the men has a name: they are Subject #15 or #51 and so on. Each of them is articulate and eager to respond: their attitudes toward women are very important to them. Each man brims with honesty—the contemporary honesty that is not far from ego. Even when the woman has a meeting with her professor in his office, he is honest with her about his wife. In the first shot a subject is seated against a brick wall, talking to us, and many shots are set against that wall. But the film varies visually: one man launches into his usual come-on spiel with women, a spiel that goes on seamlessly except that, in flashback, the women change frequently. One man “loves loves loves” women; another is viciously obscene about them. One man is marvelously successful with women and is about to reveal his secret when the sound suddenly fades. As décor and variation, two student waiters at a college party move out of their jobs from time to time to function as a chorus. Most of these scenes, and many more, all of them extended or altered, are derived from Wallace’s text, which Krasinski has combed and arranged for actors. The “hideous” in the title is a Wallace fillip. Reviewing the book in 2000, A.O. Scott wrote that “what is most striking about the interview subjects, and what they ultimately have in common, is their slippery, narcissistic ordinariness.” Krasinski has applied a touch of cosmetics to them here and there, but never to conceal any hideousness. Only one scene, though it originates in Wallace, seems out of place. Another man remembers his father, a washroom attendant who spent his life handing out towels, cleaning basins, accepting tips, always dressed in white, even his shoes. The son, in his forties today, says he never wears white. The scene is so keen that even while we watch it, knowing that it has nothing to do with the dissertation in progress, we can’t dislike the experience of it. A surprising pleasure is the color. Clothes, walls, views please our eyes even as we listen to the talk. Amazingly, too, this film, which for the most part puts one or two people before us, was shot in wide-screen. Then we note that the cinematographer of this modest first film is John Bailey, one of the best (Groundhog Day and sixty-nine others). Apparently Bailey wanted to flout expectation, to show us that, contrary to rules, one or two people, imaginatively framed, can fill a wide screen. 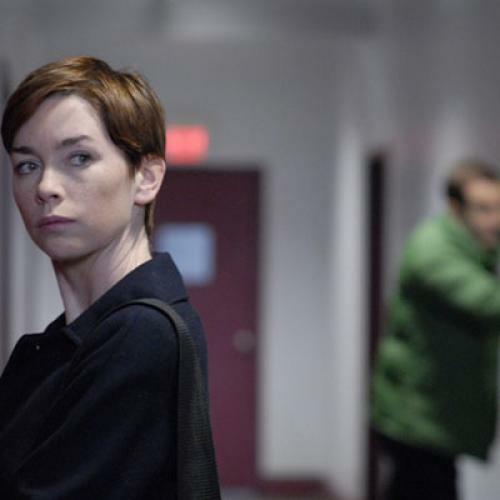 Julianne Nicholson, who plays the dissertationist, left her verve at home. In most of her scenes she is just about present, which is acceptable when she is merely questioning. In the one scene outside the researching, in her apartment, she receives her ex-boyfriend, played by Krasinski. The trouble simmering between them is heated by Krasinski but is tepid with Nicholson. Timothy Hutton plays the professor with his usual ingratiating non-acting. All the other actors are vivid and interesting. Ultimately this film is a quiet revelation. At first we may sniff at the form that has been imposed on Wallace’s pyrotechnics. Gradually, however, we realize that we are sharing the fruit of a fifty-year development. When television arrived, a besetting fear in the early days was of “talking heads,” one-shots or two-shots or even three-shots of people conversing. It seemed crude and static compared with the infinite variety of cinema. But in the following decades, our expectations have changed—or broadened. Charlie Rose and Larry King and many others have seduced us into intimacy as a usable replacement for visual variety. If the talk is good and the editing at least moderately nimble, the “talking heads” program has become one of the kinds of shows we want from television. This change may be one of the few cultural benefices of television. Krasinski’s film is not the first—outside of documentaries—to lift it from the small screen to the large. (Remember The Designated Mourner.) But this film boldly plants that form here as an instance of cultural change. Krasinski has chastened a lot of Wallace’s prose ventures, but he has ventured cinematically himself. The French director Claire Denis has written, with Jean-Pol Fargeau, a screenplay about Parisians that is different. 35 Shots of Rum concerns a fortyish railway driver, his twentyish student daughter, his ex-girlfriend, and the daughter’s boyfriend, all of whom live in the same apartment house in three apartments. (Father and daughter live together.) The difference is that all these Parisians are black. Denis began her career in 1988 with Chocolat, which dealt with a French girl and a black man in Cameroon. I haven’t seen all of Denis’s films since then and don’t know how often she has returned to the subject of race, but she does so here, winningly and well, merely by (except for one sequence) paying no attention to it. These people simply are black, living their lives. Even in a sequence with two white women, race is not mentioned. Apparently all these people were originally from the Caribbean, live in a district centered on the Rue de la Guadeloupe, and thrive in their society. Lionel, widowed a long time ago, and his daughter Josephine love each other and enjoy that love by doing everyday things every day. Their quiet pleasure in each other’s company suffuses the screen. She is a student with a job in a record shop. One of her classes, with a black teacher and all-black students, is charged with racial anger. (Frantz Fanon is inevitably mentioned.) But though the paper being discussed that day is by Josephine, she never utters a word on a related subject outside the class. She, her father, and friends obviously expect their lives to go on like any others. In a rueful way, this becomes too true—at least for Lionel. The time comes for change. Josephine is to leave, presumably with her boyfriend, who is off to somewhere in Africa. The film assumes a likeness to several Japanese films that are about the particular poignancy in a father whose care and nurture lead, inevitably, to loneliness (even though Lionel has previously asked her to feel free to leave). Woven through the central story is a minatory counterpoint about a colleague of Lionel’s who retired and who finds that the job that filled his life was his life. We don’t see Lionel taking any preparatory steps for himself, but we do see him discovering his colleague’s fate. Before Josephine leaves, he evidently wants her to be reminded of her mother. They drive to Lübeck in northern Germany and visit her mother’s sister, white, affectionate, very German. Over coffee, race is never mentioned. Father and daughter visit the mother’s grave. Then, back in Paris, comes their own parting. The story is not exciting, but it is irresistible—because the people are endearing. We keep feeling not only that it is all credible but that we want the company of these two characters, and we wriggle a bit at the thought of their separation. The title of the film is ungainly but not irrelevant. To drink thirty-five shots of rum in one sitting is a goal that apparently Lionel has set for some reason and has failed to reach. Nineteen is the max so far, done by one of his friends. (When Lionel comes home after one attempt, Jo kisses him and says—matter-of-factly, not reprovingly—”You smell sloshed.” It’s simply what Lionel does once in a while.) At the end, when she leaves, he makes it to thirty-five—and apparently holds them. We draw our own conclusions about the relation between that goal, Jo’s leaving, and Lionel’s future. A cinematic reason for the film’s pleasures is the way it looks. Denis quite clearly envisioned it before she shot a foot of it; and with the aid of her cinematographer, Agnes Godard, she has clothed the picture in mellow tones—nothing bright or cheery to underscore the congenial mood, blues and shadows for the most part, to convince that this good feeling occurs in reality, not a movie. Alex Descas is staunch yet vulnerable as Lionel, Mati Diop is a zephyr as Jo, Nicole Dogué is amiable as the ex-girlfriend, and Grégoire Colin burns appropriately as Jo’s swain. Those who treasure Fassbinder films will be glad to see Ingrid Caven, one of his favorites, as the German aunt. Along with the post-film glow, however, I’m still wondering about those thirty-five shots.